Holly O’Donnell is a freshman and writes for the Features section of the paper. 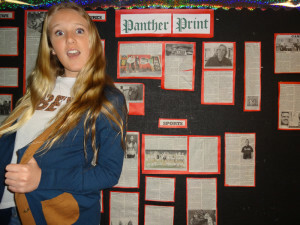 She has only been on the Panther Print squad since the beginning of her freshman year. She has never had any experience in journalism and writing for q newspaper, but she has had plenty of experience with creative writing and loves writing freely. Holly hopes to gain new writing skills as a member of the staff because likes writing; however, she hopes to pursue a career in science as an astronomer.